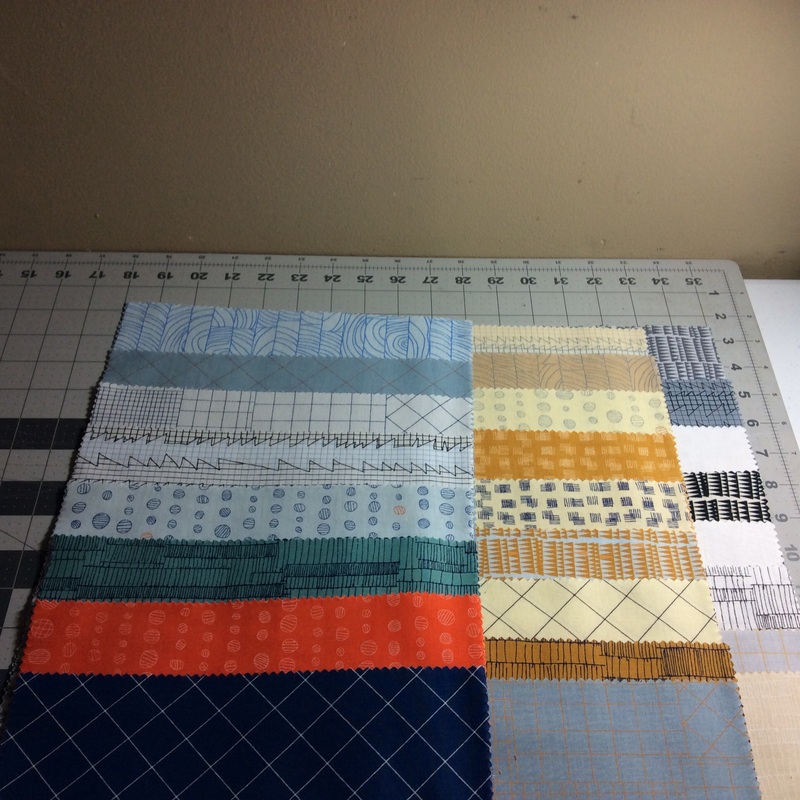 Still being a relatively new quilter, I am finding myself late to the party discovering and becoming a fan of fabric designers and collections. Over the past several months I have seen Carolyn Friedlander’s Doe collection used numerous times in many of the blogs I follow. I love Carolyn’s modern design aesthetic which continues in her Carkai collection that will be available next month. I can’t wait to meet her next June at Glamp Stitchalot 2016. Given that Christmas is less than five weeks away, all of my current sewing/quilting is for Christmas presents. But I have a selfish sewing project that I hope to start during the long Christmas weekend that will use two Doe layer cakes. I have decided that my full-size bed needs a quilt that is not purchased from Kohl’s (something that is sacrilege for someone so bitten by the quilting bug!). I will cut each ten-inch layer cake square into four five-inch squares and use two-inch sashing to separate the squares, perhaps Kona Putty. I had much more success with the sashing for my sister’s Coffee and Cream quilt blogged about here than the quilt I made earlier in the year for my stepdaughter when I decided that sashing sucked! I have revised my opinion of sashing, and though I still feel it is challenging to get all my seams lined up, I love sashing’s modern look. For the back of the quilt, I treated myself to some mottled grey fabric at BackSide Fabrics, so I can turn the quilt over and display other quilts as bed runners. It shouldn’t take me too long to sew the quilt top together before I turn it over to my longarm quilter friend, Peggy Lopez O’Neil for her to work her quilting magic. I’m wondering if there any tips more experienced quilters can share that may improve my sashing skills? Linking up with Molli Sparkles: Sunday Stash. This entry was posted in 2015 Finishes, Quilting. Bookmark the permalink. One option for sashing is to include “keystones” or a different fabric at the intersections so that you have seams to use as a guide to line up. Then, with a lot of pinning, it should come together nicely. She has a few tips that might help. It explains Yvonne’s idea about using keystones. I’d like to go on record saying that the quilt my sister made for me is lovely and the sashing looks perfect to me. I do have a background in graphc design so I know my straight lines!! Her’s are great! Thank you again, ML.